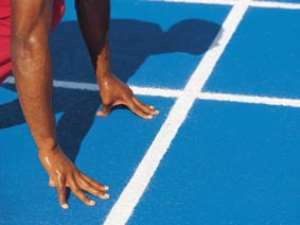 Accra, Dec. 23, GNA - The Ghana Olympic Committee (GOC) and the Ministry of Education, Youth and Sports (MEYS) are in discussions to initiate a programme to train a new breed of young Ghanaian athletes in the US in order to make a great impact at the 2008 Olympic Games in Beijing, China. Consequently, the GOC has struck a deal with the Andrew Young Training Centre in Atlanta, Georgia in the US to train at least 10 of the nation's budding athletes in addition to those who will benefit from the International Olympic Committee's (IOC) scholarship programme. Mr Benson Tongo Baba, President of the GOC told the GNA Sports in Accra that the programme would cost Ghana 300 dollars per athlete per month to implement. He said to ensure that the arrangement would be carried through, the GOC was in talks with the MEYS to fashion out ways by which the two bodies would shoulder the responsibility of providing 3,000.00 dollars per a month to meet the demands of the Centre. In addition, the GOC was also lobbying the IOC to increase the country's beneficiaries of its training programmes from five to seven for the 2005/2008 season. Vida Anim, 100-metre finalist at the Athens Olympics, Aziz Zakari and heptathlete Margaret Simpson are the current beneficiaries of the IOC scholarship for the 2001-2005 season. Asked why only three athletes and not the usual five are currently benefiting from the IOC programme, the GOC boss explained that their predecessors - Tanko Ibrahim, Anthony Awire, Vida Nsiah, Monica Twum and Zakari complained about the poor condition of facilities at the their training centre during 1997-2000 season. Mr Baba said the criticism and protest by the Ghanaians infuriated the IOC technical men who reduced the number of beneficiaries to Ghana from five to three in the 2001-2005 season. He said, however, that though the Ghanaian athletes were vindicated after an inspection tour on the facilities, the action to reduce the number had already been taken. The GOC boss said it was on the basis of the justification of the athletes' protest that the GOC based its demand for an increase in the number of beneficiaries for the 2005-2008 season to seven. Mr Baba said his outfit was fighting hard to secure scholarships for budding track star, 14 year-old Vivian Mills who won bronze at the just ended Commonwealth Youth Championship in Melbourne, Australia, and other medal hopeful to be grafted into the foreign legions who will form the core of the country's athletic dream team. Assessing the country's performance at the Athens Olympics, Mr Baba said although the athletes failed to win any medal, the future looks quite bright. His optimism stems from the fact that most of the athletes were young and were making their maiden appearance at the Olympics, adding that under the circumstances, their output was not abysmal in any way. Ignatius Gaisah placed fifth in the long jump, Margaret Simpson was among the final eight in the heptathlon, while Vida Anim recorded the fastest time during the heats in the 100 metres. Mr Baba said those achievements were signs of a bright future, adding that if the plans of breeding the young ones went through in addition to the IOC scholarship beneficiaries, the sky would be the limit for Ghana by the next Olympics. He called on those responsible for the development of facilities for the Cup of African Nations (CAN) 2008 to incorporate other sporting facilities such as tartan tracks and sports halls into their projects so that the country's athletes could come down for trails ahead of competitions to justify their selection as has been the practice in Jamaica.